George Johnson (born 1926 in Nelson, New Zealand) is an artist who made his name in Australia. Johnson studied art under the emigre artist and Bauhaus graduate Theo Schoon, who confirmed an early commitment to modernist art, especially Geometric Abstraction. He graduated from Wellington Technical College in 1947. Johnson decided to relocate to Melbourne, Australia, in 1951 where he was soon drawn into contemporary art circles, mixing with Leonard French, Roger Kemp, Inge King, Julius Kane, Peter Graham, Clement Meadmore and others. 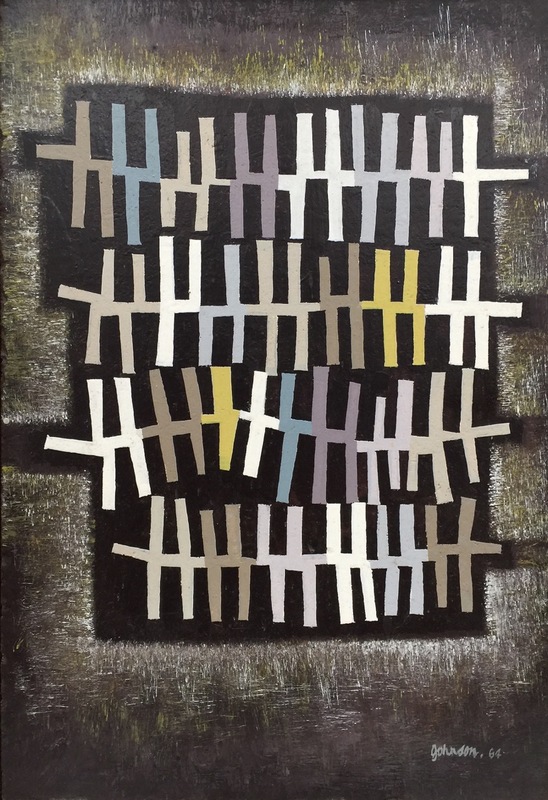 He held his first solo exhibition there at the age of 30 in 1956, a selection of boldly geometric abstractions which set the art scene buzzing. By this time he was sharing a studio with French and the pair experienced increasing friction from the Heide Circle. This comprised a rival group of figurative modernists who were still trying to control the Contemporary Art Society, including Arthur Boyd, John Perceval, Charles Blackman and Robert Dickerson. Johnson has remained unwaveringly committed to geometric abstraction in the many decades since, producing paintings that are stylistically and intellectually indebted to Russian Constructivism.